John Joseph Pershing was born near Laclede, Missouri, on 13 September 1860. He attended the State Normal School and then graduated from the United States Military Academy in 1886. He was commissioned a second lieutenant and served with the 6th Cavalry. From 1886 to 1890, he was assigned to duty in the Southwest and Northern Plains; he fought in the Wounded Knee campaigns. From 1891 to 1895, he taught military science at the University of Nebraska. He studied law while he was there and received his degree in 1893. Pershing was made a first lieutenant and assigned to the 10th Cavalry. Before the Spanish-American War, he taught tactics at West Point. During the Spanish-American War, Pershing fought with the 10th Cavalry in Cuba. He participated in the San Juan Hill operations. Promoted to major of volunteers, Pershing was assigned to Army headquarters and the Office of the Assistant Secretary of War from 1898 to 1899. Pershing reverted to captain in 1901 and served with the 1st and then the 10th Cavalry. Pershing then served in the Philippines as a departmental adjutant general and engineer officer. 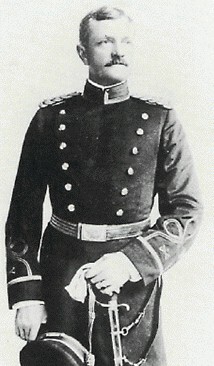 From 1903 to 1904, he served with War Department General Staff, before attending the Army War College. In 1905, he married Frances Warren, and then was a military observer of the Russo-Japanese War. President Theodore Roosevelt promoted Pershing to brigadier general over 862 senior-ranking officers in 1906. He successively commanded the Department of California and Fort McKinley. Later, he was assigned to the Office of the Chief of Staff and then served as governor of Moro Province. He commanded the 8th Infantry Brigade at the Presidio of San Francisco from 1914 to 1916. In 1915, his wife and three daughters were killed in a fire. In 1916, he led the Punitive Expedition into Mexico and was promoted to major general. In October, 1917, he was made a full general. General Pershing led the American Expeditionary Forces during World War I. He was made General of the Armies of the United States in 1919. After the war, he prepared a report of the war and made extensive military inspections. From 1 July 1921 to 13 September 1924, he served as the Army Chief of Staff. He established the War Plans Board, urged national preparedness, supported officer schooling, and sought a well-regulated militia. Pershing retired from active duty in 1924. From 1923 to 1948, he was the chairman of the American Battle Monuments Commission. He died in Washington, D.C., on 15 July 1948.